My husband is known for his all-or-nothing, go-hard-or-go-home approach to, well, pretty much everything. 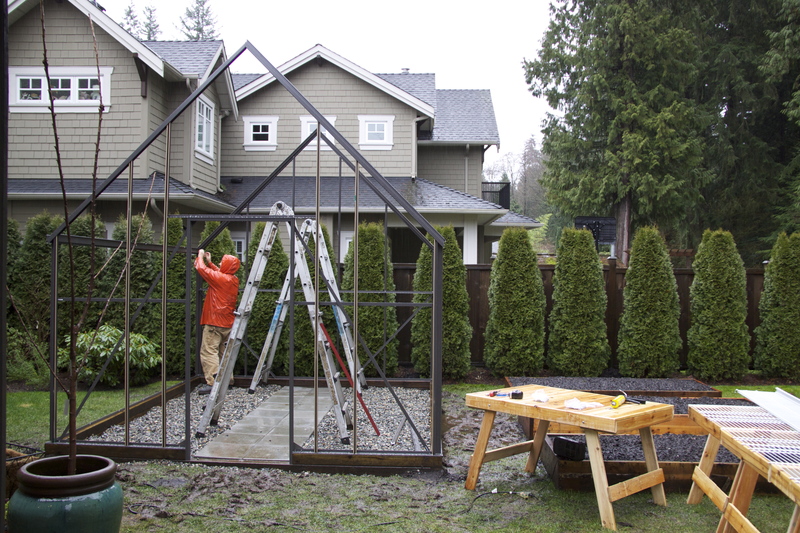 When he set his mind putting up a greenhouse, only the best would do. And we found it at BC Greenhouses. 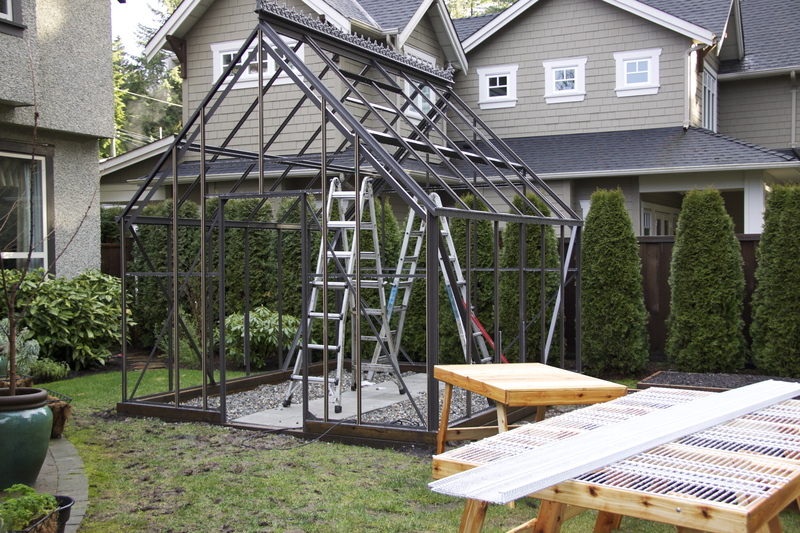 The greenhouse we chose was a tall, 10′ x 12′ all glass model with a high slopping roof. Clearly it needed a sturdy foundation to secure it from winds and keep it from sinking into the waterlogged sod. We were most relieved they offered some help with installation; here Nathan Steegstra perseveres in the mud and rain. 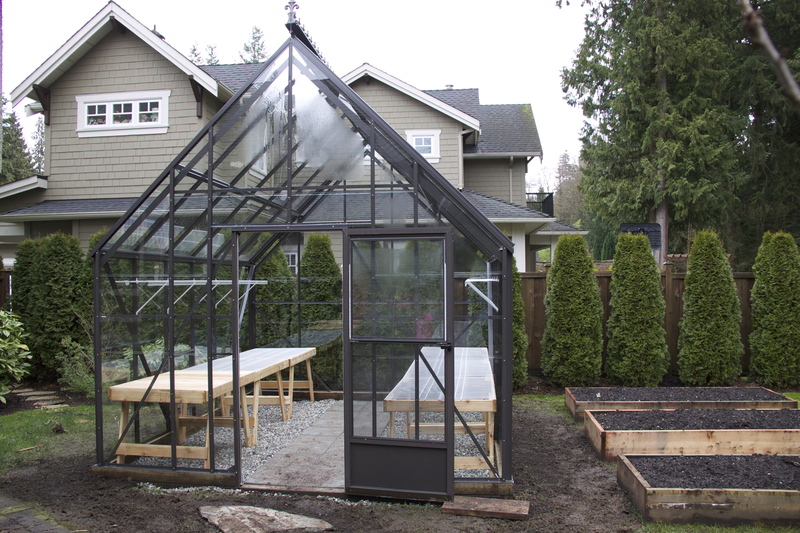 We’re quite thrilled with the end result and dealing with BC Greenhouses has been nothing but a pleasure. 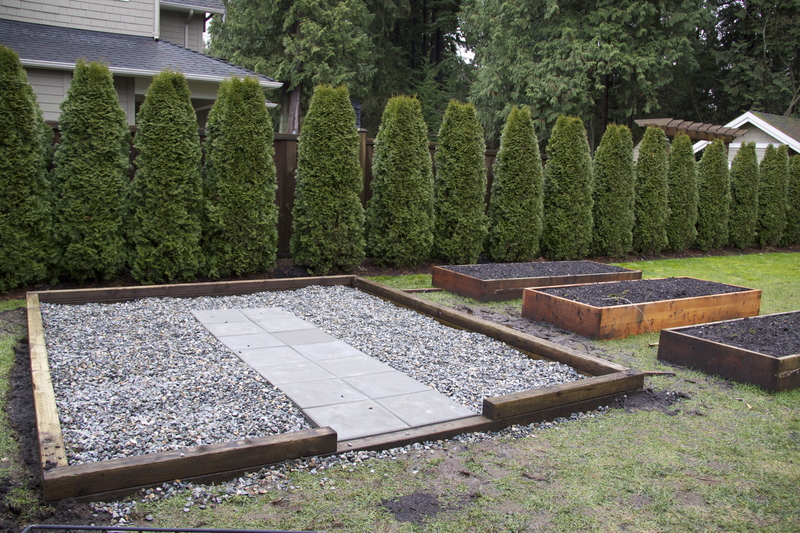 If you’re so inclined, I can highly recommend you speak with Christine; you can reach her at christine@bcgreenhouses.com or 1-888-391-4433. This entry was posted in gardening, greenhouse, organic, organic, urban farming and tagged BC Green Houses, foundation, foundations, glass greenhouse, greenhouse, greenhouse foundation, greenhouses. Bookmark the permalink. Wow, what a great job your husband has done!!! We look forward to watching further sucesses. Thanks for the pictures. What great team effort with the preplanning and now the great results! Your garden productivity should be amazing this year and keep those pesty critters out and yet have produce outside as well. The greenhouse looks like it can handle alot of plants. Look forward to viewing your growing season and all your informative blogs! Let’s switch-I’d love some time on your farm!! Breathtaking! What a beautiful home, backyard and, now, greenhouse. You guys are so fortunate….